Awaiting execution for the murder of her pimp, Theresa Marie Magnarelli, or Traci as she now calls herself, forms a bizarre relationship with Tory Gardiner, the new widow of her court- appointed defense attorney. 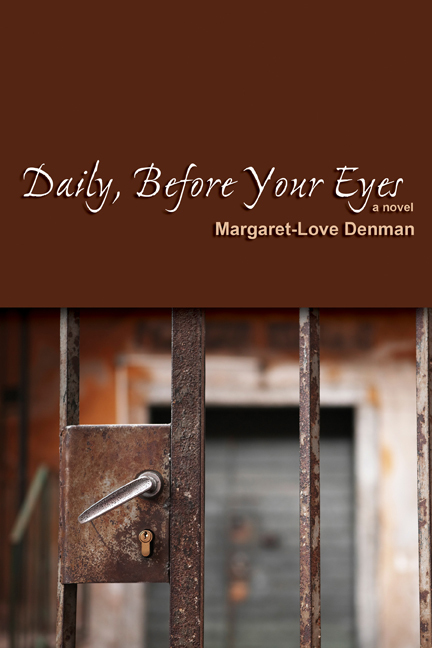 Daily, Before Your Eyes follows the unlikely journey of these two women into the dark world of Death Row, exposing Junior Leaguer Tory Gardiner to the lies of her own world as well as the realities of a larger world she has never known. An unlikely bond develops between these women—one, a sheltered member ofthe middle class, the other streetwise and turning tricks by the time she was sixteen. They find a commonality in daughters they both loved and lost and in their dependence on men who disappointed them. While appealing Traci’s conviction, they both seek redemption: Tory for her husband’s negligence and Traci for her life. Margaret-Love Denman directs the creative writing program at the University of New Hampshire. She is the author of A Scrambling After Circumstance and Novel Ideas: Contemporary Novelists Look at the Creative Process, which was nominated for both PEN/Faulkner and PEN/Hemingway awards.